(Akron, OH) – Here at Hoppin’ Frog Brewery we’ve learned to tame the yeast like never before! 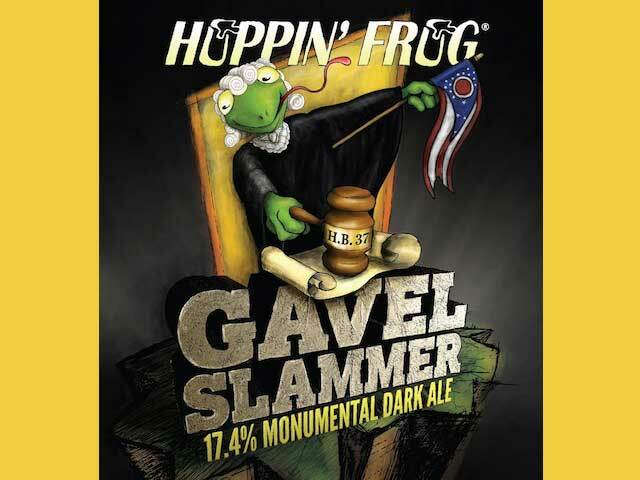 So, I’m extremely happy to announce that on Black Friday, November 25th we will be releasing Gavel Slammer 17.4% ABV Monumental Dark Ale!! We created an amazingly complex and satisfying flavor profile with this beer, and its more balanced & smoother than we ever imagined. Beers like this are really hard to make and take a long time to mature – they are few and far between. So, Gavel Slammer will be sold exclusively at the brewery, on draft and in bottles to-go, and will not be released for distribution. Only 1,500 bottles of this coveted beer were made with a 3 bottle limit per person! Along with this high profile release we will also be releasing B.O.R.I.S. Grand Reserve, our most refined version of our flagship beer, this is the smoothest version of B.O.R.I.S. ever created! Originally reserved for only family and friends, we will now release this very special brew to the public for the first time. This beer will have a one case limit. We will open doors one hour early, at 10:00 a.m. both on Friday and Saturday to accommodate these very special beer releases. And to celebrate in a grand way, we will be offering chicken and waffles for breakfast! What a great way to start your holiday shopping – early, and at Hoppin’ Frog Brewery!! Mark your calendars now for Friday & Saturday, November 25 & 26 – we hope to see you here!